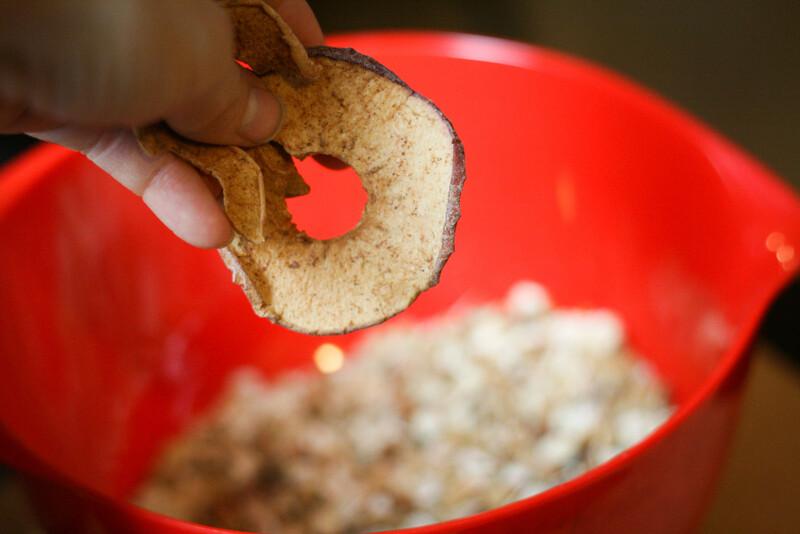 Allow me to introduce you to my new favourite, healthy snack – Martin’s Apple Chips! These are the tastiest apple chips and they are made in Canada by the very family that grows the apples. 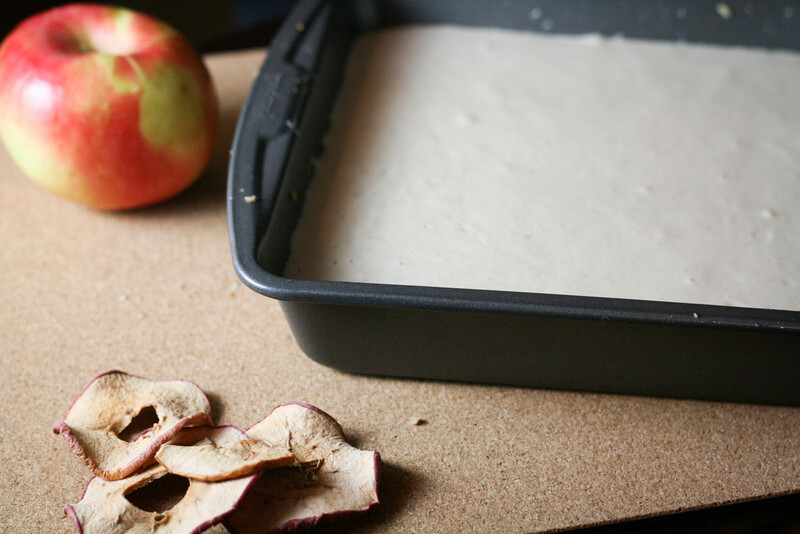 I used to make my own apple chips every so often and although I’m a fan of making things from scratch…some things are better left to professionals. Martin’s apple farm is located in Waterloo, Ontario and has gone from having 100 trees in 1971 to 700 acres in 2017. You could say they know what they’re doing. Learn all about their story here. 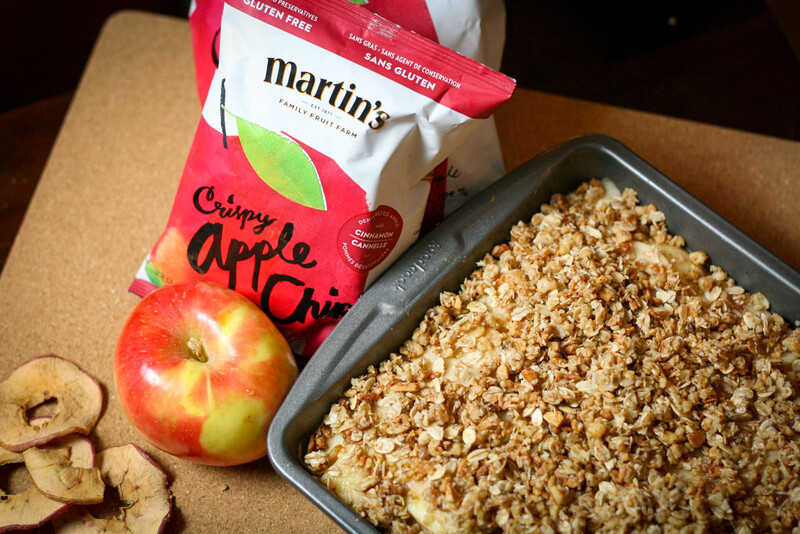 Martin’s Apple Chips come in several different flavours – regular, cinnamon, caramel dream and chocolatey drizzle. 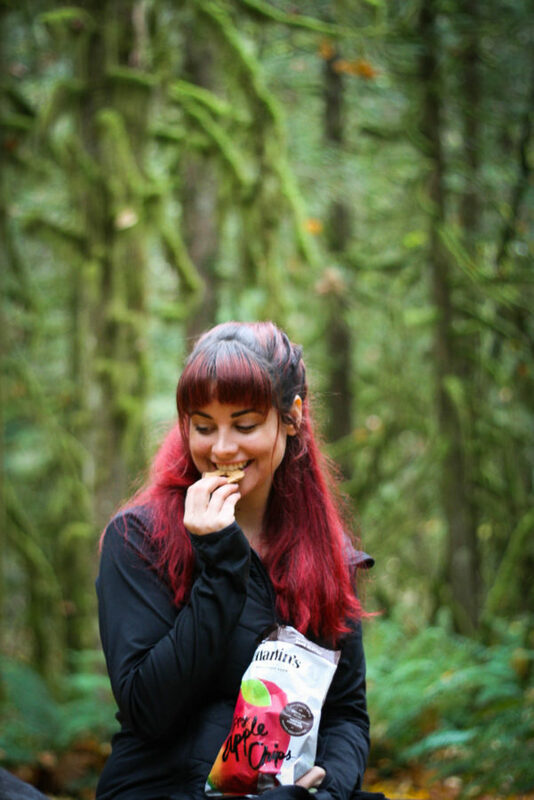 While I love the regular and cinnamon (simple is best for me), the chocolate and caramel are such an awesome treat, especially for a mid-hike boost! The reason I’m digging them so much is because they are so healthy and easy when you’re on the go. I keep some snack-packs in the car for “emergencies” a.k.a. when I’m hangry. 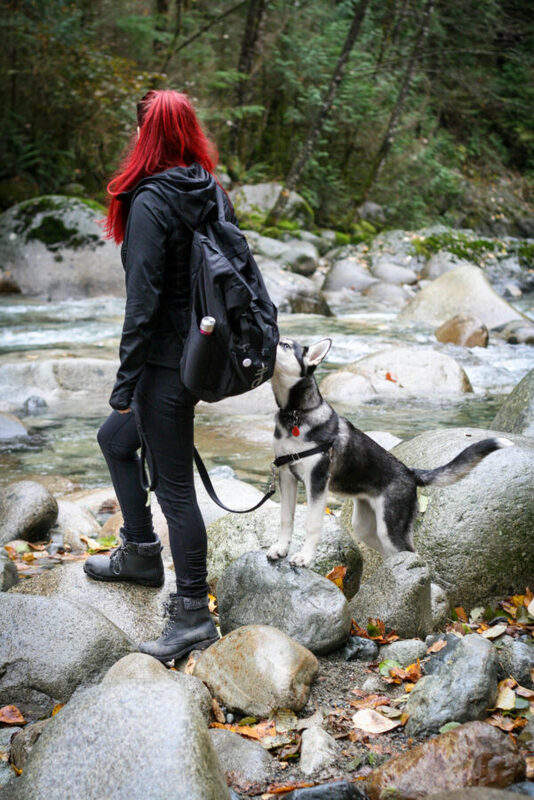 I also bring the bigger bags with me on hikes with my pup, Flokie – they are portable, they fit in my backpack, I don’t have to worry about them getting bruised or staying fresh. They really tick off all the boxes! I had the nicest Autumn hike with Flokie this past weekend. We picked a crisp, chilly day and headed to the mountains where we walked amongst red and gold leaves, mossy green trees and a beautiful river. When we (okay, when I) got tired, we stopped for a snack break. Flokie definitely wanted to get in on my Martin’s Apple Chips! Of course, being in Vancouver it started to pour with rain mid-hike. We hit the trail back to the car and headed home to warm up and get cozy. 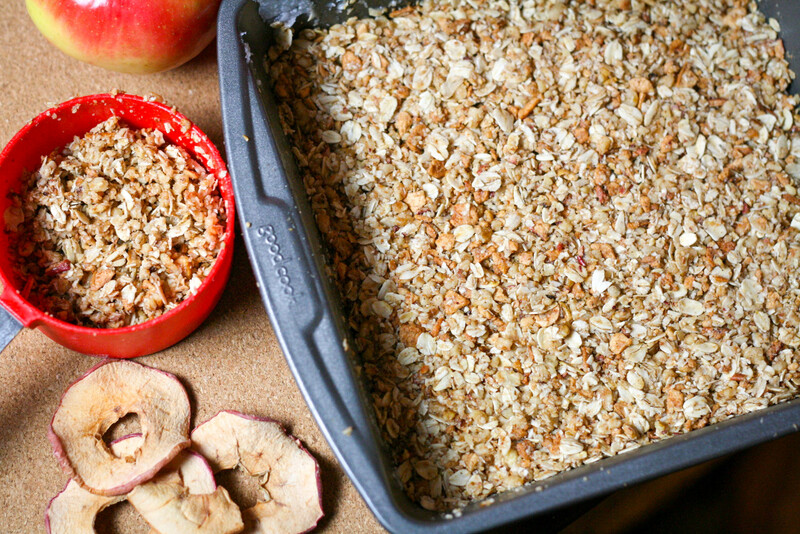 The most comforting thing I could think of indulging in was a baked apple crumble. Oooh, just imagining the scents of all those flavours of cinnamon, apple and maple wafting throughout the house on a cold day…sold! I got to work and ended up with the dreamiest apple crumble bars. 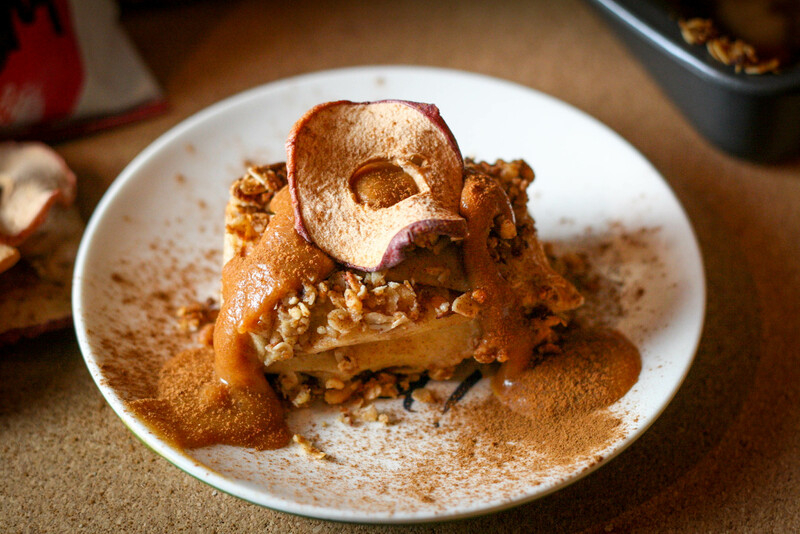 The cashew cream layer just takes it to a whole ‘notha level and the date caramel…it says optional, but c’mon people! Go for it! 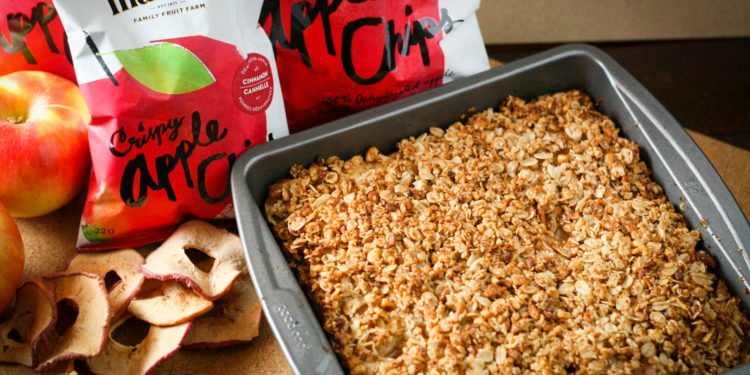 The cinnamon Martin’s Apple Chips add the perfect crunch to the crumble and it’s hard to believe this decadent dessert could be dairy-free, gluten-free and refined sugar free! 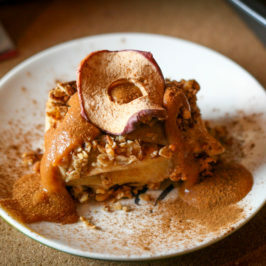 A dairy-free and gluten-free recipe for apple crumble with a creamy cashew cheesecake layer and sweet date caramel to drizzle on top! Preheat oven to 350 degrees F and grease an 8x8 square baking tin. 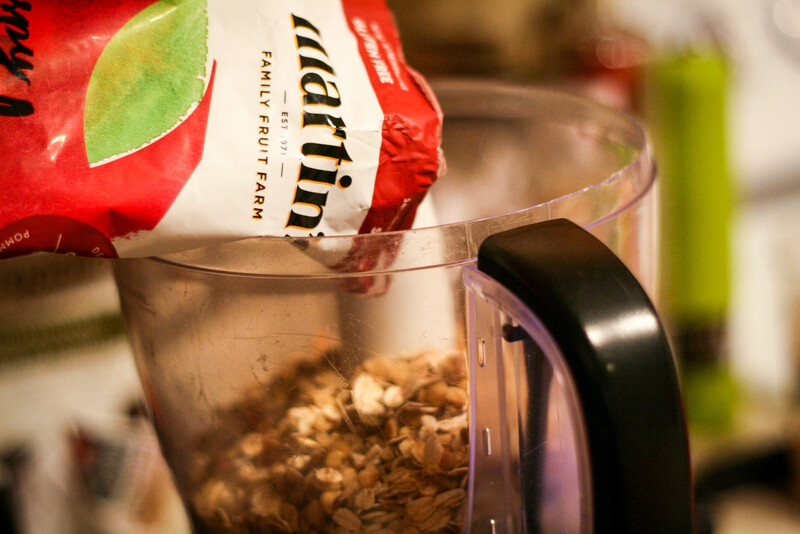 Combine Martin's Apple Chips, chopped walnuts and 1 cup oats in a food processor. Pulse until crumbly and small chunks remain. 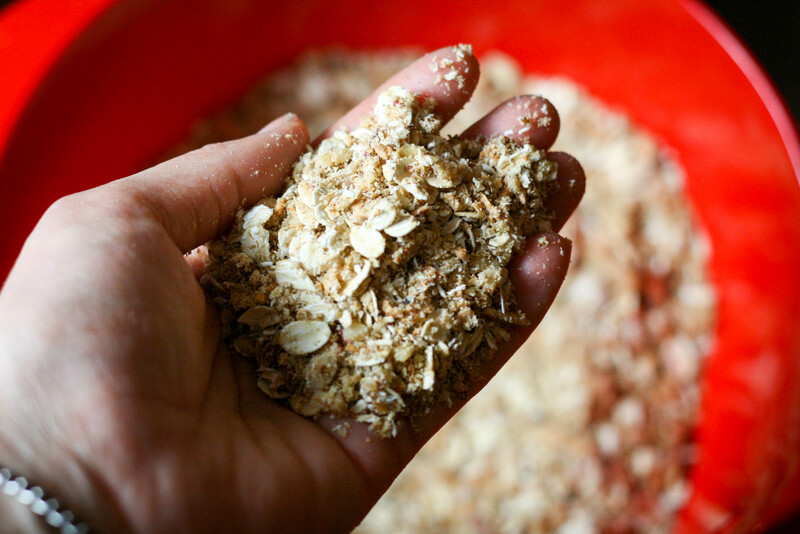 Stir in the remaining oats and the melted coconut oil. Toss together. Place roughly half of the mixture (~2.5 cups) into the bottom of prepared baking tin. Set the rest aside. Combine all ingredients in a high speed blender and blend until completely smooth. Pour over crust and smooth out. Toss all ingredients together until well combined. 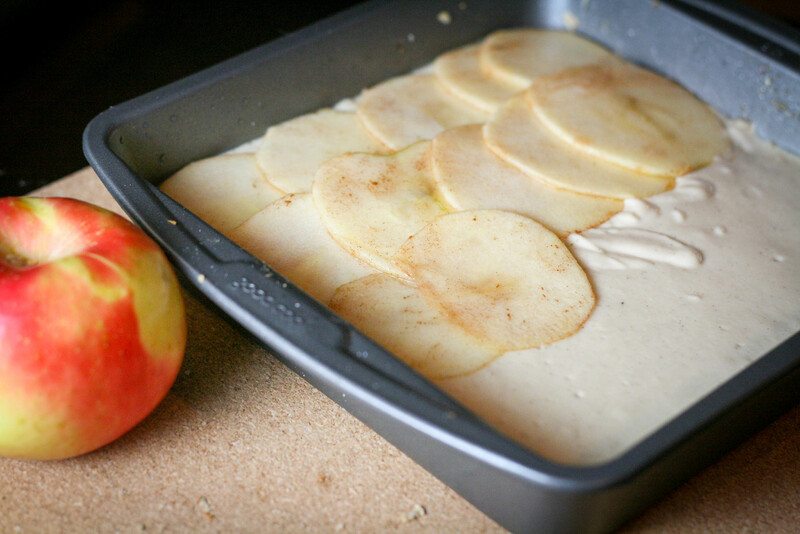 Evenly layer apples over cashew cream layer. 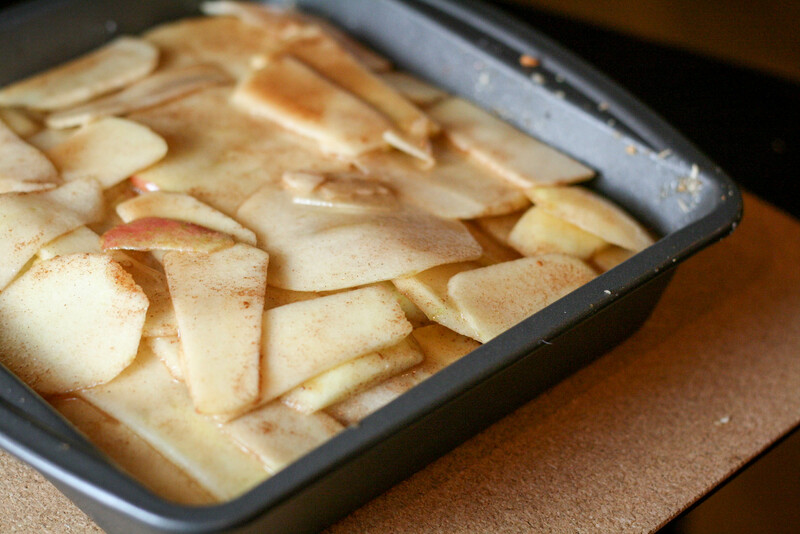 Top with remaining crumble and bake for 40-45 minutes until crumble is golden brown and apples are soft. 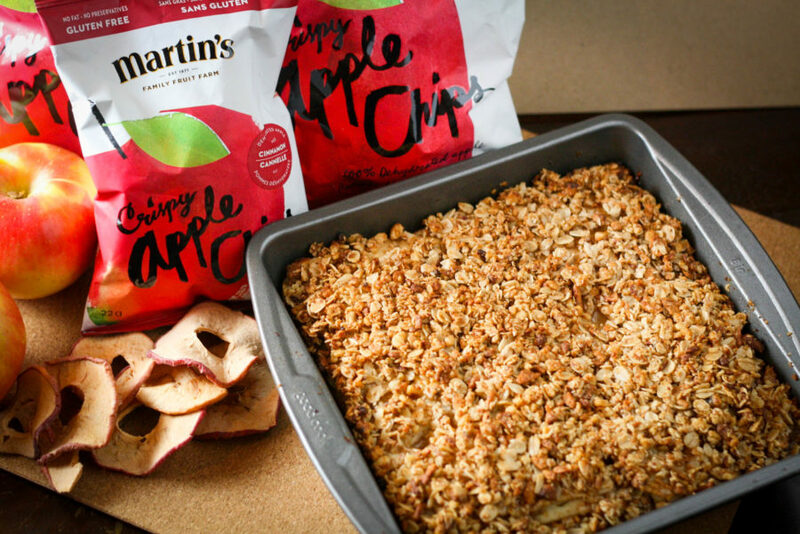 Cut into bars, drizzle with date caramel and garnish with a Martin's Apple Chip! 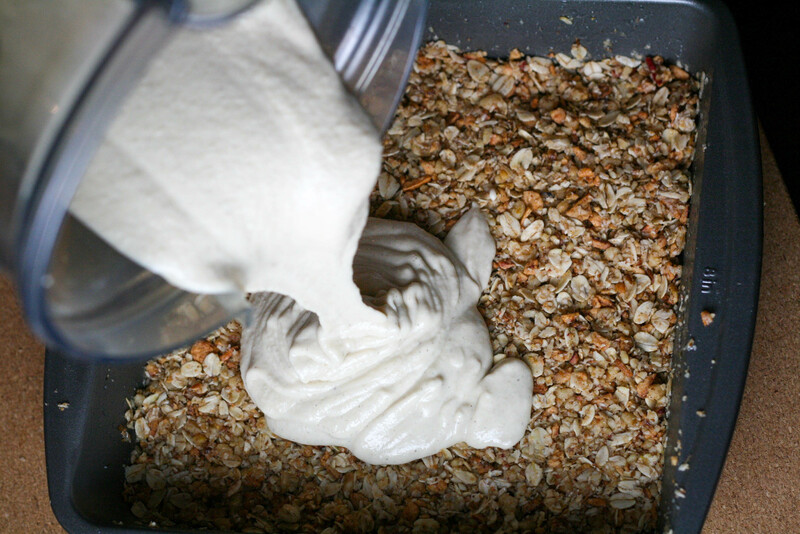 Place all ingredients in a high speed blender and blend until completely smooth. Now that is how you end a day of hiking. 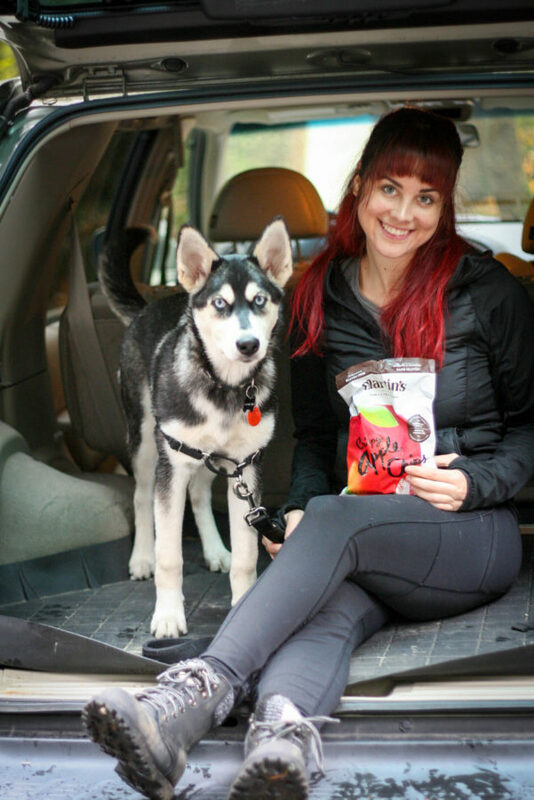 Thanks to Martin’s Apple Chips for keeping me fuelled up! 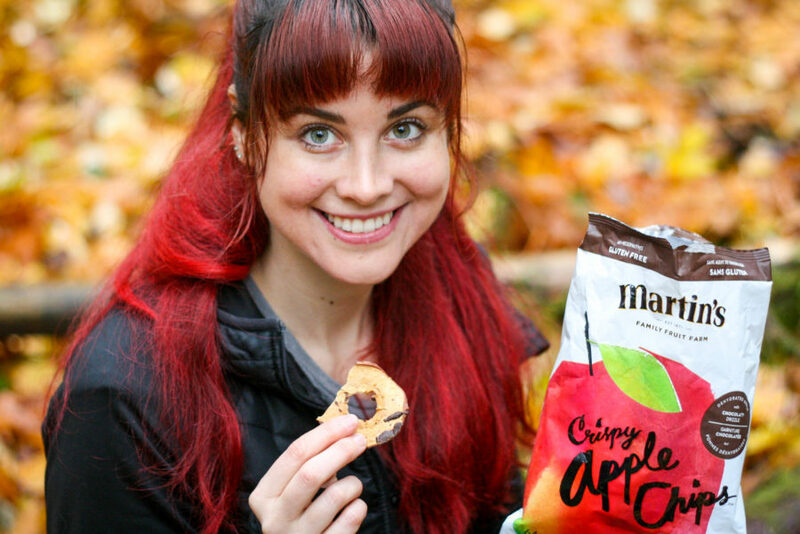 You can find Martin’s Apple Chips conveniently across Canada at stores like Costco, Starbucks, Sobeys, Winners, Bulk Barn, Farm Boy and more! This post was sponsored by Martin’s Apple Chips. All views and opinions are my own.